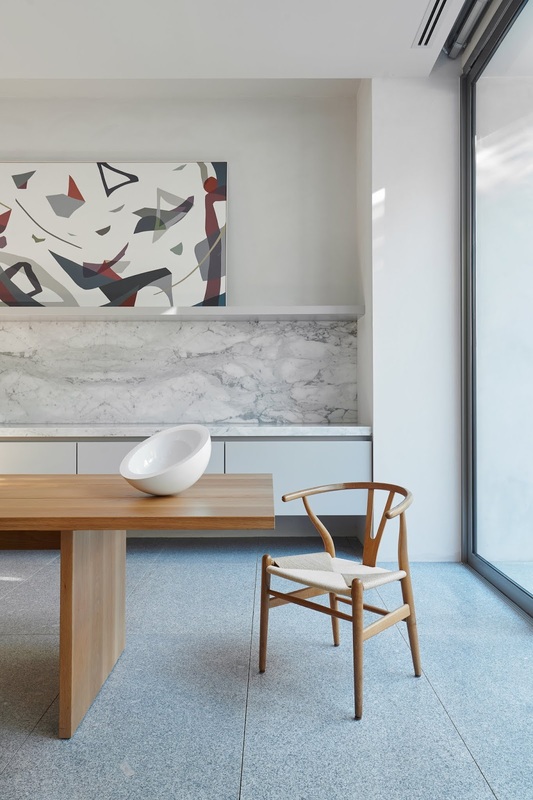 Located in Toorak, suburb of Melbourne, Australia, SLD Residence designed by Davidov Partners Architects is an exercise on the purity of forms, materials and details. 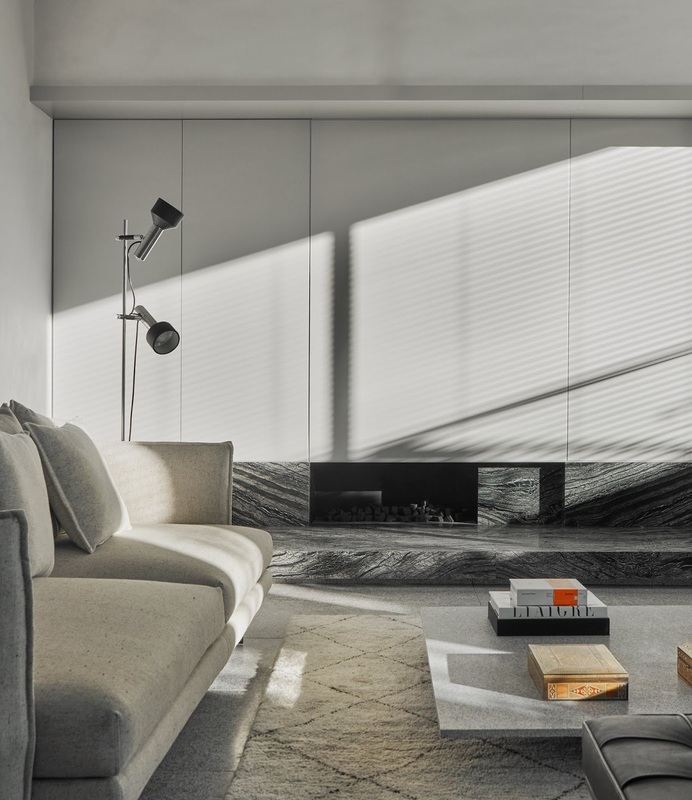 A stark monolithic façade disguises a house abundant in natural light. The SLD Residence is located on a busy road in inner-Melbourne. Whilst the road is a prominent tree lined boulevard our clients wished to maintain a sense of privacy from the street in both a visual and acoustic sense. 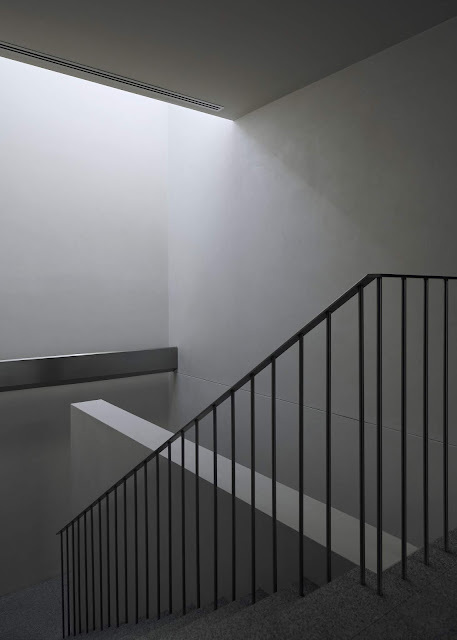 As such, the presentation of the house to the street takes the form of a pure unadorned mass on the first floor suspended over a recessed lower level. The span of which is interceded by a solitary concrete column, the only relief afforded to the facade. This creates a house which possess a presence within the streetscape that is comprised of an eclectic mix of bold mid-century housing and more traditional styles. Of particular interest is the iconic Leslie Perrott designed Troon (1964) which is located diagonally opposite the house and also presents as a sheer double storey wall to the street. Mass and depth are utilised in an abstraction and contrast to the faux period houses that are more ubiquitous with local trends and although simple in its execution the house still references notions of the piano nobile on the first-floor master windows which are located at the front of the house and offer views down the tree lined street. The width of the block (17.5m) allowed for circulation around a central core on the ground floor which enabled the design of the house to be structured around 2 primary rooms, one living the other for entertaining. 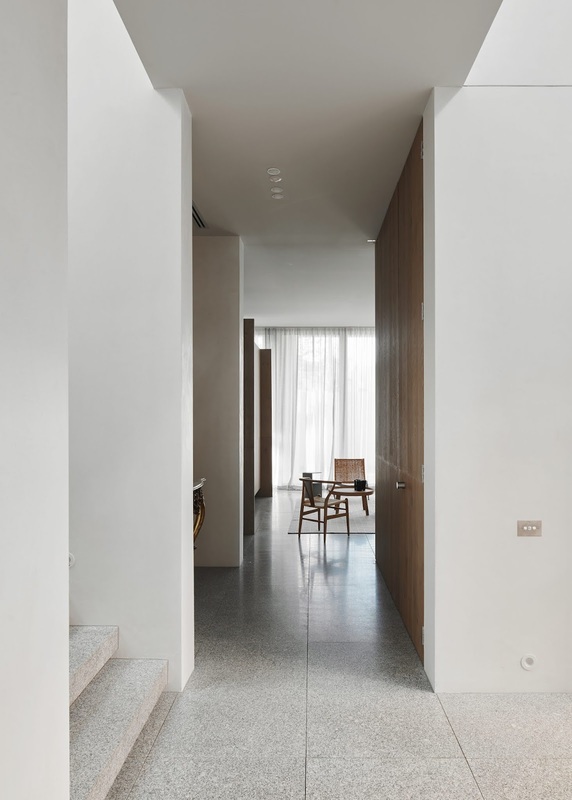 The rooms are each fitted with elements allowing the spaces to function with a minimum of additional furniture required and are linked via a corridor which connects the other vertical circulation of the house. Another smaller corridor connects the dining area to the kitchen. The circular ground floor circulation also allows the large house to feel compact whilst providing separation between spaces. 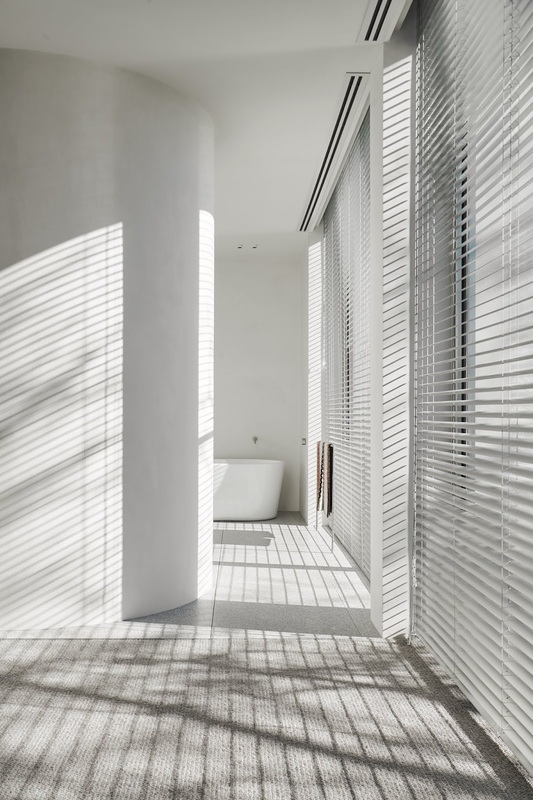 The main corridor also contains the centrally located entrance that is located on the side of the house to maximise privacy and allow for an abundance of natural light. This area also features an external light shaft that reflects light into the double height foyer whist also screening views from and two the neighbouring house. The external walkway that takes guests from the street along the side of the house to the front door allows for a moment of disengagement from the street and allows for the house to subtly reveal itself, inviting guest into a double height loggia prior to formally entering the home. This transparency is repeated in the basement entry which features a glazed cellar which greets the owners on their arrival. The large concrete column which dominates the façade also serves as an orientating device, visible at the end of the main corridor. The house, utilises a very limited palette of natural materials to create a strong degree of flow between interior and exterior spaces. 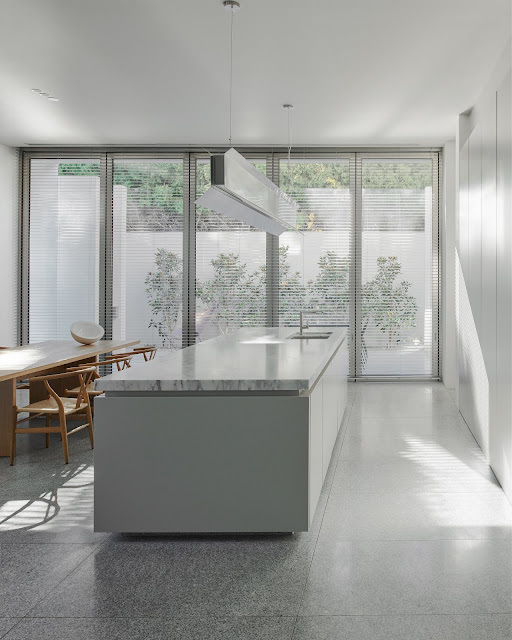 The natural cement render used externally is echoed internally with a coarsely applied venetian plaster finish, whilst the honed granite floor is carried through the house on all floors and echoed in the hard and soft landscaping and driveway ramp. 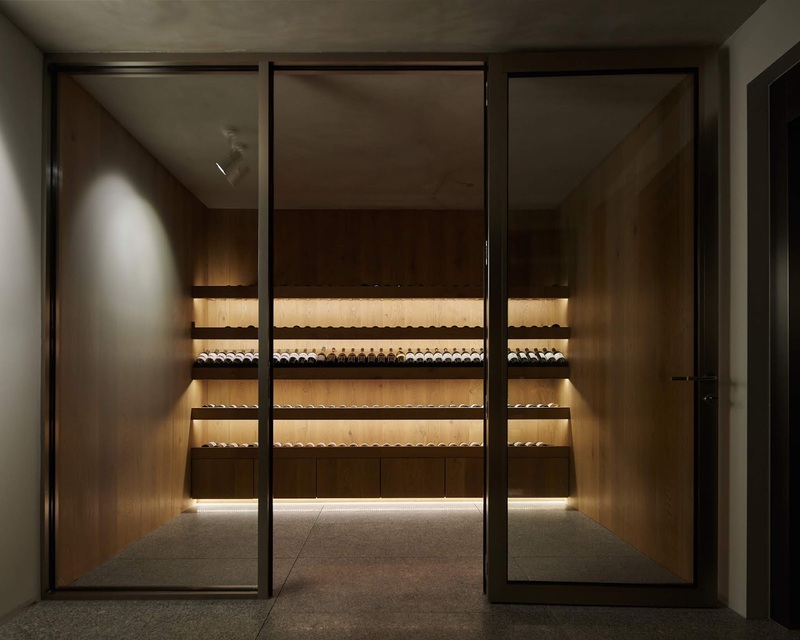 The use of the same materials internally and externally is intended as a means of deliberately drawing the interiors outward whilst allowing the natural patina to underscore the passing of time and the seasons. 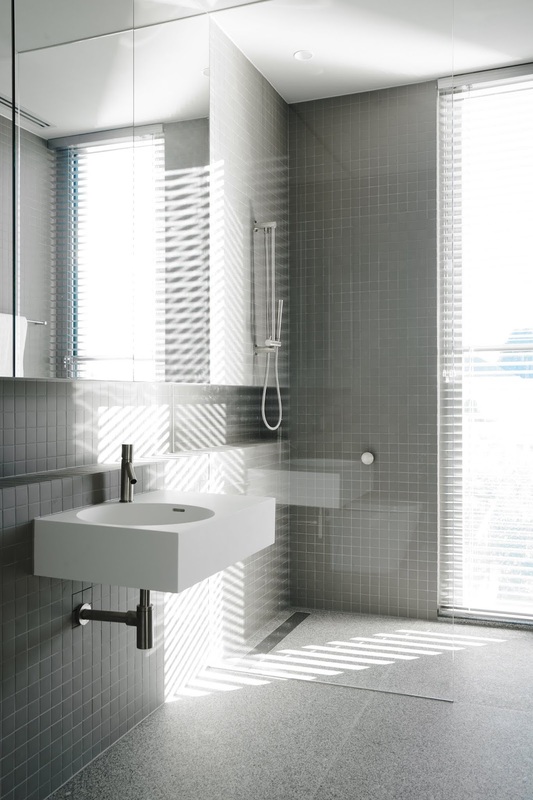 This connection is reinforced through the fully glazed pivoting/sliding doors to the 2 main exterior spaces further underlines these strong connections. Warmth and detail is brought into the design through the use of smoked European oak floorboards which were used to line the key internal doors and panelling. 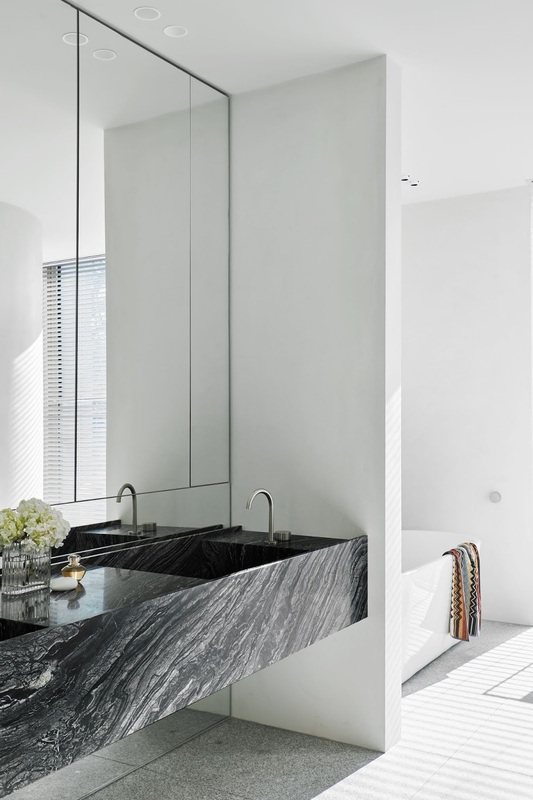 Other elements such as the bar, bathroom vanities and plinths are formed from unembellished slabs of monochromatic feature marble. 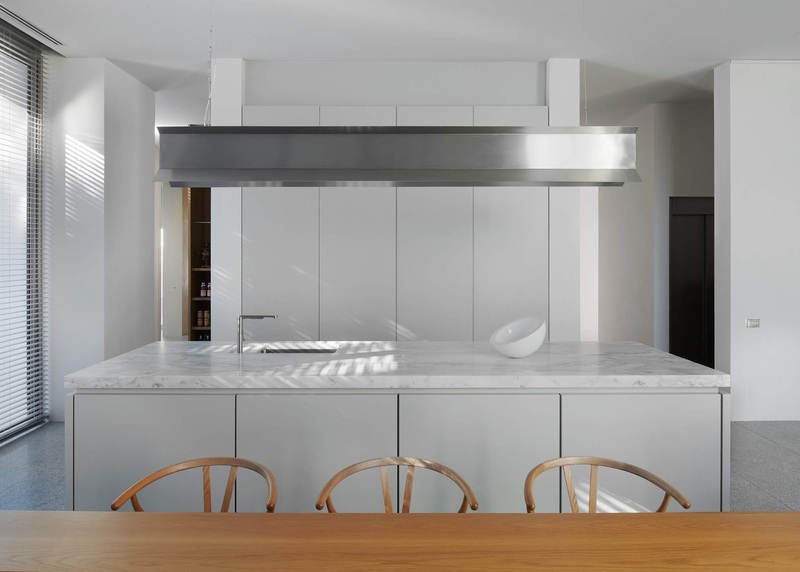 Expanding on the raw elements used throughout the house brushed stainless steel is used for the staircase balustrading, window framing and is also used for the entry gate enclosure and custom designed island pendant light. The formal dining area is framed by various objects which help to create a more intimate atmosphere and house our clients vintage 1970s dining setting. An oak lined room divider conceals a TV to the lounge room and transforms into a black backdrop to the dining space. The master bedroom occupies the front section of the first floor, providing it both privacy and a northern and southern aspect. 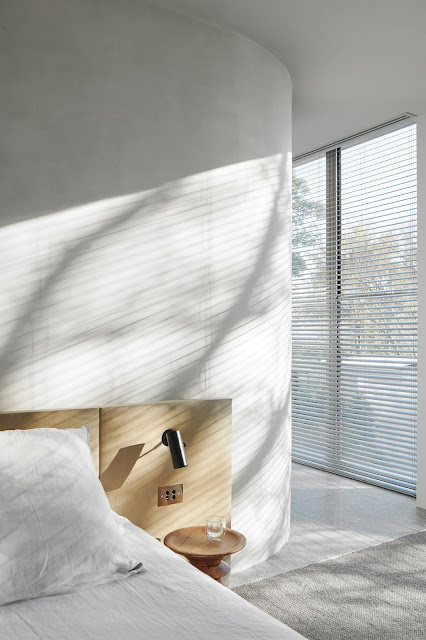 Conceived as a hotel suite come bedroom the space is open plan and free flowing between the ensuite space, dressing room and bedroom. 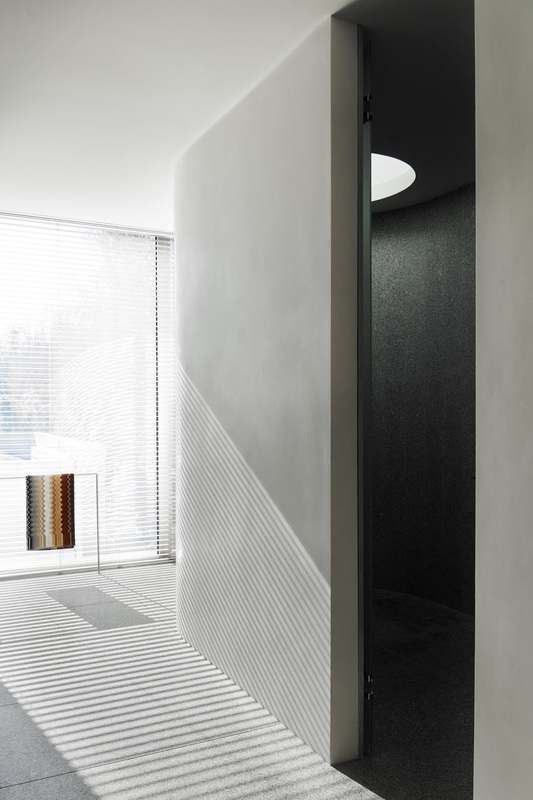 A centrally located capsule acts as an anchor for the bed and contains the WC and curved shower, replete with its circular skylight.